Since 1996 I have planned and promoted many succesful regularly scheduled antique auctions in the metro Atlanta area. However one of the more interesting Georgia antique auctions that I have had the privilege to photograph, document and advertise in print as well as online. Featured the estate of Martha Estelle Peacock Patton of Barnesville, Georgia. Not only did I have the excitement of searching through the Barnesville, Georgia home for undiscovered Georgia antiques while packing and hauling. Phil Patton II and I spent quite a bit of time researching family history for clues related to the valuable Georgia antiques, antique furniture and collectibles that the Patton home contained. "John took me to the small town where my Mother was born and found pictures in the historical society of a mansion my Great Grandmother was raised in and helped me identify innumerable portraits of relatives from pictures found in the attic. By the time John and I had finished combing through the County Register, the local newspaper and the town cemetery, I came to know as much about the history of my family as my 90 year old Mother." Mrs Patton lived to be 90 years old and and was a direct descendant of the prominent Banks, Peacock and Stephens' families. Mrs Patton's mother who was the daughter of Ralph Banks Stephens lived in the antebellum home pictured above with her parents before moving to the Barnesville, GA area in the early 1900's. When I arrived at Mrs Patton's Barnesville, GA home I soon found that most of the furnishings were either antique or collectible. With some special treasure waiting to be unearthed almost everywhere I looked! 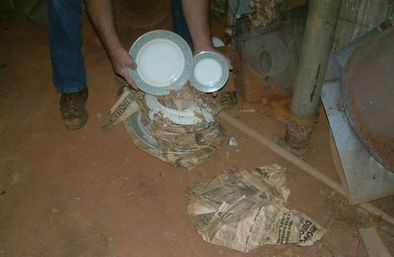 The attic contained lots of interesting items including a barrel of Nippon china. Even the dirt floor basement which was thought not to contain anything of value yelded a few pieces of fine china. I took several pictures inside the Patton home to document this once in a lifetime event which may be viewed in the photo album. Of special historic interest was a selection of 1800's antique furniture that once decorated the above Forsyth, Georgia antebellum home. 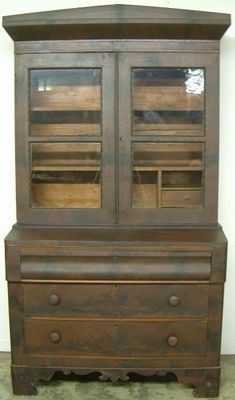 This furniture was passed down through Mrs. Patton's mother, Mrs. Pearl "Stephens" Peacock. Mrs. Patton's estate also includes her mother's sterling silver, clocks, fine china, paintings and glassware. Plus many elegant pieces of china that Mrs. Patton purchased while living in Europe. 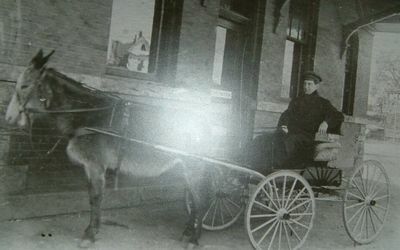 The above photo of R. Banks Stephens was taken in front of the Forsyth, Georgia railroad station circa 1910. Which is now the home of the Monroe County Historical Society. The flamboyant Banks Stephens owner of the Bank of Forsyth, Georgia was often seen riding his buggy around town throwing coins for boys to scuffle over. Today Banks Stephens is remembered for his help in bringing public education to Monroe County, Georgia. 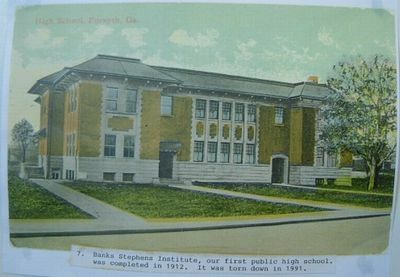 Because of the of the large sum of money that R. Banks Stephens donated, Forsyth's first public high school was named Banks Stephens Institute in his honor. 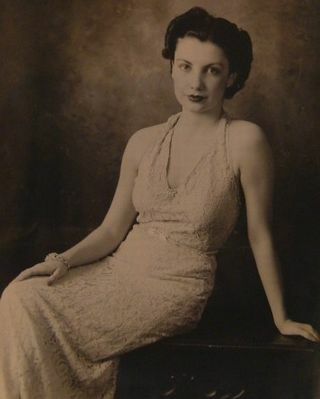 I am posting Pearl Stephens' obituaries as they contain quite a bit of early Stephens family history. Pearl Stephens was a sister to R. Banks Stephens and a very well known Georgia teacher! With a school in Macon named after her because of her work in early Georgia education. 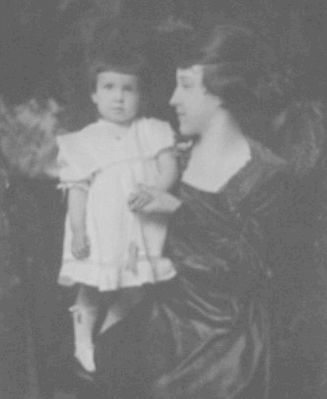 Pearl Stephens was also the aunt of Pearl "Stephens" Peacock and the great aunt of Mrs. Patton. There may even be a few items included in the Patton estate auction which were passed down from the Pearl Stephens estate? As the second obituaries states "The bulk of the estate of Miss Stephens was left to her nieces and nephews". The key note of this famous Georgia teachers life is embodied in this simple phrase, her favorite quotation "For the sake of the little child". From the day she began her teaching career at seventeen, at old Mt. Zion Church, Monroe County, her entire life was dedicated to this "All we have to give is not too much for the children." The late George Long editor of "The Macon Telegraph" understood this, and paid this tribute to her while she was teaching at Elam Alexander Normal School. "In some respects "Miss Pearl" is the greatest human asset Bibb County possesses. Hers is a work she has seen bigly from the start, and she has made so many more see even their first starts in a noble and sacrificial calling. She is leaving her owm impress indelibly on the lives, character and culture of whole generations through the teachers whom she trains. She gives inspiration and beacon light to others of us who are inclined to triffle with fine opportunities. Miss Pearl keeps right on putting more and finer outgivings of herself into this communiy all the time. God bless her! Pearl Stephens was the daughter of John Turner Stephens and Mary Louisa Banks. She was born in Forsyth, Georgia, August 13, 1861 and died in Atlanta, June 28, 1923. She is buried in Forsyth. Her paternal grandparents were William Boyce Stephens and Pamellia Turner. Dr. Stephens was a noted and beloved physician of Forsyth. He was a leading Baptist, and a member of the Forsyth Baptist Church. When the church was remodeled some years ago a memorial tablet was placed to these grandparents by "Miss Pearl". Her maternal grandparents were Thomas Alston Banks and Mary Jones Chipman of Elbert County, Georgia. Her mother Mary Louisa Banks, an only daughter, was born Dec, 5, 1833. She married John Stephens. There were two children, Ralph Banks Stephens and Pearl Stephens. When the War Between the States began, John Stephens went with Co. K. of the 1st GA Regimont to Pensacola. Later he went to Virginia where he was in many of the large battles. After the War, he returned to Forsyth, broken in health. He soon died. 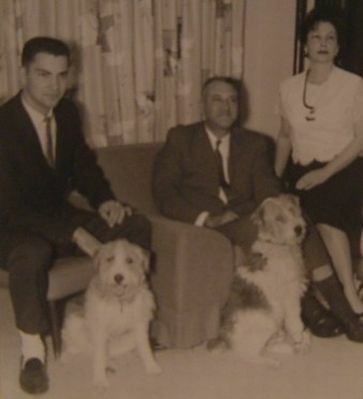 His widow with her two small children went to Muscogoo County to live with her brother, Mr. Ralph Banks. "Miss Pearl" was taught by her mother for several years. Then she went to a private school in Butler, Georgia. When she was seventeen her teching career began. With her mother, she taught in a small county school. She saved her salary so that she might go to Peabody, Nashville. Often she would tell her girls at Alexander Normal School, "That year's of teaching in the county did so much for me. I realized for the sake of the children whom I was to teach, I must learn how to teach." The death of Miss Pearl Stephens in Atlanta on Thursday, June 28, brought sorrow to her host of friends in Forsyth, where she was born and lived prior to her engaging in educational work in Macon. Miss Stephens had been in ill health for a number of months and for several weeks prior to her death it was known that the chance of her recovery was slight. She was a member of one of the oldest and most prominent families of Forysth, being the sister of R. B. Stephens, and had brought fame to herself and added to the good reputation of her native town by the prominent and useful place which she had held for many years in the educational world. Miss Stephens completed her education at Peabody College in Nashville, Tenn., after which she was connected with the school system of Macon fo forty-two years. At one time she taught in the high school, afterwards taking charge of the Whittle school and was then transferred to the normal school. In each position she gave eminent satisfaction and left the imprint of her personality and scholarship upon all who came under her instruction. It has been stated that probably seventy-five percent of the teachers of Bibb County received their final instruction under Miss Stephens. The funeral was held from the Baptist church in Forsyth Friday afternoon, June 29 being conducted by Revs. 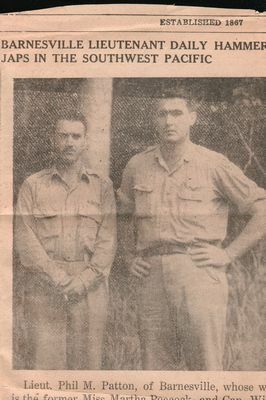 R. L. Bivins and A. Chamlee. The esteem and affection in which Miss Stephens was held was amply attested at the funeral ceremonies. Music was rendered by Mrs. L. S. Jackson, Mrs. O. P. Ensign, Mr. H. E. Dennis and Mr. Charles Hardin. Following the tribute of the ministers, Mr. Ellsworth Hall of the Macon Board of Education voiced the sentiment of the school authorities concerning the excellent work of Miss Stephens. Many teachers and pupils and other prominent citizens of Macon attended the funeral and a wealth of floral offering gave evidence of the respect in which the deceased was held. The bulk of the estate of Miss Stephens was left to her nieces and nephews, with a few special bequests to other relatives and friends. Mr. John T. Stephens was named executor. "On a high elavation overlooking the town of Forsyth, located at 226 West Johnston Street, is the home of Mrs. Frank B Willingham. The house is Southern Colonial in style with its spacious design and stately, tall Doric columns across the front of the house. The columns and the dining room mantles were made by hand, as was the custom in those days. Medora Field Perkerson writes in White Columns of Georgia "The Willingham house is the only one this writer has seen in Georgia with an uneven number of columns. There are five across the front of its long porch with steps at the end instead of the center front." 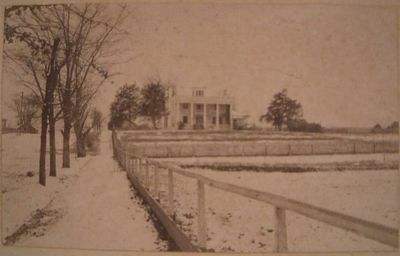 Court records show that Dr. William C. Wilkes, the first President of Monroe Female College (now Tift College), bought the property in 1851, and it is assumed that he built the house. He sold the property to B.L. Willingham in 1863. 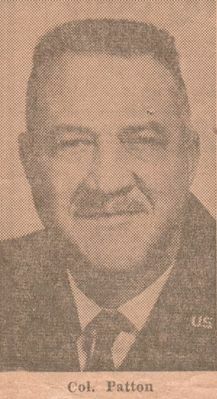 Later Banks Stephens became the owner. From his heirs the Frank B. Willinghams bought the property in 1930." The two pictures above document a rare Forsyth, Georgia snowfall which took place during the late 1800's. 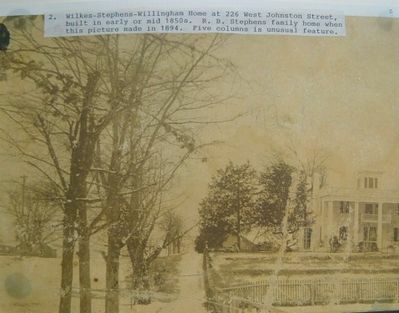 The picture above was taken from near the Monroe County Court House looking west at what is now West Johnston Street. 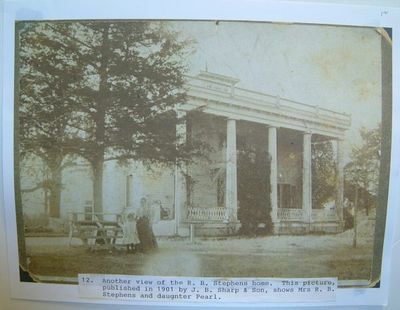 The above picture shows Mrs. Stephens standing in front of the family antebellum home with daughter Pearl. The picture was taken in 1901 by J. B. Sharp and Son. The Patton estate auction contains a number of pieces of sterling silver that Pearl received as a wedding gift when she married on January 22, 1916. On Saturday afternoon, January 22nd, at 5:30 o'clock, the wedding of Miss Pearl Stephens and Mr. Normam Andrews Peacock was quietly solemnized, Rev. W.G. Crawley officiating. Only the immediate members of the families were present. The bride wore a becoming traveling chiffon blouse and a small satin hat. She carried a beatiful bouquet of bride's roses and valley lilies. Immediately after the ceremony, Mr. and Mrs. Peacock left for a visit to Florida. Upon their return they will be home with Mr. and Mrs. A Peacock in Barnesville. The wedding had not been announced and it was a surprise to many of the people of Forsyth. However a large number of friends assembled at the station and showered Mr. and Mrs. Peacock with their congratulations. The bride is the beautiful and unusually charming daughter of Mr. and Mrs. R. B. Stephens. Forsyth, perhaps had no more popular young woman than she. Her father, the President of the Bank of Forsyth is one of Monroe county's most prominent citizens and Miss Stephens was numbered among Forsyth's most attractive young women. By her charming personality and her delightful womanliness she had won a host of loyal friends; who give her up with reluctance. The groom is the son of Mr. and Mrs. A. Peacock of Barnesville and is one of the most popular and most prominent young men of the city. Among the out-of-town guests at the wedding were Miss Pearl Stephens of Macon and Misses Estelle and Alta Peacock of Barnesville. Mrs. Stephens (should have read Mrs. Peacock) will be a distinct addition to the social set of Barnesville. 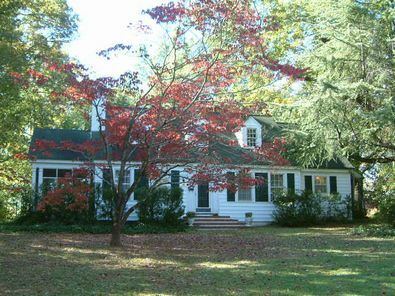 Mr. and Mrs. Peacock moved into the Barnesville, Georgia home (pictured above) in 1932. Family members believe that the home was mostly furnished with "Stephens" furniture at that time. Which would appear to be logical considering that the Stephens' antebellum home had been sold two years before. Phil M Patton joined the AirCore during World War II, receiving the Distinguished Flying Cross for his service as a bomber pilot. "The Distinguished Flying Cross is a medal awarded to any officer or enlisted member of the United States armed forces who distinguishes himself or herself in combat in support of operations by "heroism or extraordinary achievement while participating in an aerial flight." 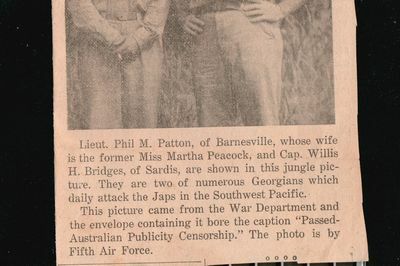 After World War II Phil Patton was stationed and lived with Martha in Europe. Before retiring from the Air Force in the the early 1960's Phil M Patton reached the rank of Colonel. As Colonel he was in charge of the US Special Weapons Division at Sandia, NM. "An Air Force officer, with 20 years of service, was promoted recently to the rank of colonel at Sandia Base. He is Col. Phil M. Patton. 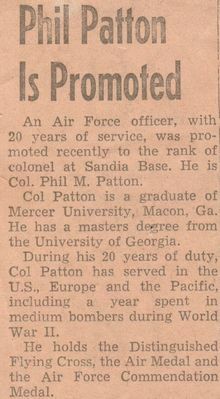 Col Patton is a graduate of Mercer University, Macon, GA. He has a masters degree from the University of Georgia. 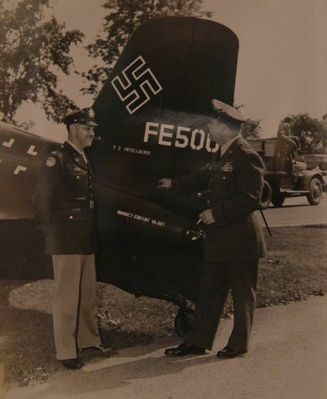 During his 20 years of duty, Col Patton has served in the U.S., Europe and the Pacific, including a year spent in medium bombers during World War II. He holds the Distinguished Flying Cross, The Air Medal and the Air Force Commendation Medal." 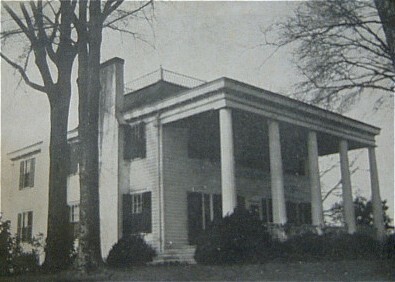 After Colonel Patton's retirement he and his wife Martha moved into the Barnesville residence with Martha's mother (Mrs. "Stephens" Peacock). According to son Phil Jr. (pictured above in group photo) the home remained pretty much as it had been when first furnished by Mrs. "Stephens" Peacock in the early 1930's. 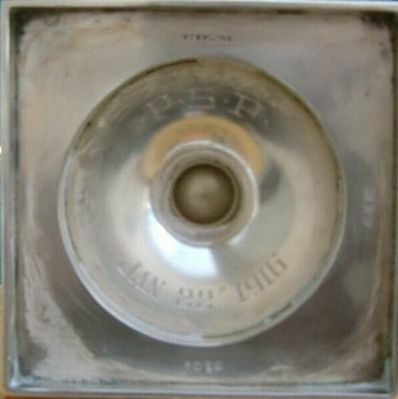 With the major exception being the addition of "fine" collectibles that Martha Patton had purchased while living with Colonel Patton in Europe.